Mrs. Hankinson's Class: A Monday Freebie! Compound words are taught over ... and over ... and over ... again. 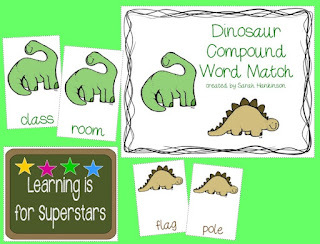 These compound word cards are designed to reinforce this skill. There are 2 different games, or combine all the cards together for one game. My goal this week is to work on our family scrapbook. I am WAY behind and I'm itching to get some of it done while I have the time! I love finding new freebies that I can use in my classroom! Thanks for sharing!